Showcase your style with the sparkling allure of this white sapphire and gemstone stackable anniversary band. Four round white sapphires are interspersed between your choice of brightly colored gemstones for a noticeable look. This band is slightly raised to show off stunning milgrain detailing along the edges and sides, giving the sterling silver a classic appeal. All carat weights and measurements are approximate and may vary slightly from the listed dimensions. Treatment code E (Peridot, Blue Topaz) and CR (Created Sapphire, Created Ruby). See Treatment Guide for further information. I purchased this ring to wear while I was pregnant and my wedding ring finger was too swollen to wear my wedding & engagements rings and got it in sapphire since it was my baby-to-bes birthstone. It served it's purpose during my pregnancy and had become actually quite special & sentimental to me. Unfortunately, one of the stones came out of it and I can't wear it anymore :( I guess you get what you pay for but I hadn't even had it for a year! Love this ring! Prettier in person. Love the size of the sapphires. Blue and white. Looks well made. I ordered both the blue topaz and pink sapphire options for this ring. Nice for an every day simple ring. The band has attactive etchings to add design. The pink stones are pretty and I'm keeping that one. The color of the blue topaz stones is so pale that you can barely see a difference between those and the white sapphire stones. Sending the blue topaz back. When I received this ring I was amazed at how beautiful it looked. Much better than the pictures online. IIt sits a little higher than I expected but was exactly as high as was described. The silver work is beautiful and the ring shank was thicker than I expected for the price. I know the pink and white sapphires are created stones, but they look stunning! I would highly recommend this ring! Much more intricate than the pictures. Bought this for a bridesmaid without seeing what the pink sapphires would look like. It was a risk, but the other good reviews were right. The pink is a paler pink sapphire, and it's beautiful. A great value! This ring is beautiful! Bought the blue sapphire and you can tell it's blue. Very happy for the price and it's not cheap looking. Will probably buy another one. 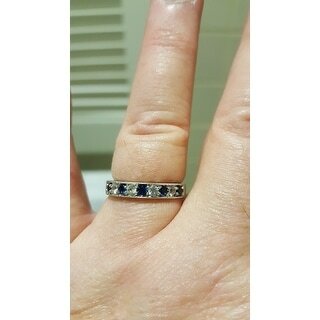 I wanted a ring that showed both the blue topaz stones and the white stones but this ring, though good quality did not show the blue stones at all. It is a nice little ring...but don't expect to see the blue stones. I was looking for a cheap band to use as a substitute for my lost wedding ring, this ring was raised more than I wanted making it uncomfortable to wear. The ring itself was pretty, it had a nice shine, and the sapphires were a pretty dark blue. I am returning it and continuing my search for a replacement. The peridot stones were very muddy in color, almost a gray, not the bright green I expected. The stones were also not matched in color. I am returning it. Stones should not come out this soon. Would not buy again and tell all friends not to buy. I bought 4 rings with varied stones. They are fun to group to match whatever I wear. Real classy look! I hated this ring. The "blue" colors, so beautifully displayed in the ad, in the one I received, there was no color at all. I sent it back. I purchased this ring with blue topaz. In the photo, they appear as a light sky blue - however, to the naked eye they are very, very pale blue - one must look very closely to see that the alternating stones have this tint. Having said this, I was still happy with the ring and my wife really liked the styling. If you really want to see the blue topaz, do not purchase this particular ring. If you understand that the blue topaz will not have a clear, obvious blue coloration, then I would recommend this ring for its simple elegant styling. This is such a pretty ring-it is perfect for a wedding band or just because. Not to gaudy or blingy but sparkles in the light. The title says it all I love this ring. I really love this ring. A good fit, comfortable, and have received many compliments. Delicate and sturdy. A very pretty ring that goes with most silver jewelry beautifully. Gems fell out, really disappointed. I love this ring and it works very well with my other ring. It’s made so well and have had no problems with it. I got the topaz and I just love the little but of color that it adds. Beautiful ring. It is good quality with lots of sparkle.. Looks nice with my solitaire. It is exactly what I wanted and I am pleased with this purchase. looks beautiful. I would have kept it but since there were only whole sizes it was too large. The ring is rather thick- so it felt funny on the hand. But - I really thought it looked great. Beautiful ring. I get so many compliments. It’s great as a stacked ring as well. "Will the Peridot be available in size 7 anytime soon"
Items are restocked as they become available, however we cannot guarantee a specific item or option will return. "Blue sapphire (as depicted in the picture with the 6 color options) is not actually an option in the drop down menu. Which one do I select to receive the blue sapphire ring?" Hello jessicay787, the blue sapphire is listed as "sapphire" from the options drop down box. Please let us know if you have additional questions. Thanks for shopping with us! "Blue sapphire (as depicted in the picture with the 6 color options) is not actually listed as an option in the drop down menu. What would I select to receive the blue sapphire ring?" 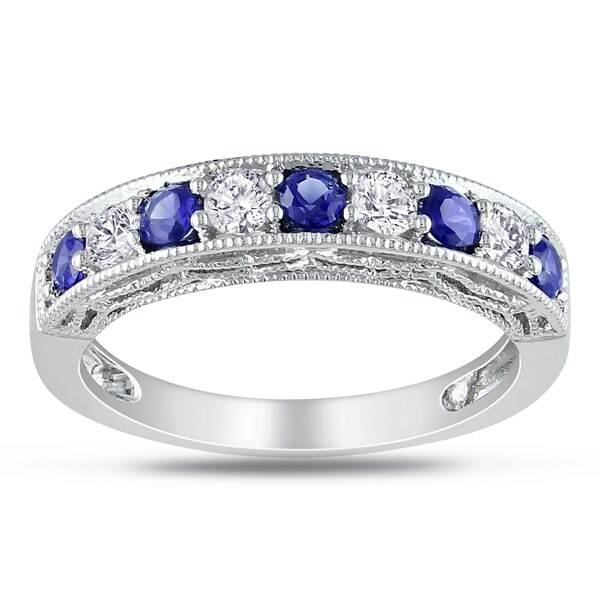 Hello jessicay787, you would choose Sapphire for the blue sapphire option. Thanks for shopping with us! I like the simplicity and elegance of the ring - the design is good.